Beckett Glass & Aluminum offers both Polycarbonate, known by the trademark (Lexan) and Acrylic known by the trademark (Plexiglas), as a glass alternative. Glass alternatives may be used in areas where safety glass is required or on your special projects where glass is not a suitable option. One of the biggest differences between Polycarbonate and Acrylic is the cost. Polycarbonate can cost on average about 50% more than Acrylic. Lexan is stronger than Plexi and has a higher level of impact resistance (250 times the impact resistance of glass). It is less rigid than Plexi and can be bought in flexible grades. 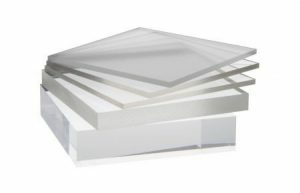 Lexan can handle temperatures up to 240 degrees Fahrenheit, has a low level of flammability and is highly resistant to acids and other chemicals such as gasoline. Lexan can also be drilled without worry of cracking and can be cold formed or bent without heating. Plexi is shinier than Lexan, has an impact resistance that is 17 times that of glass, is easier to cut and it can be polished smooth if necessary. Plexi is very rigid and cracks easier than Lexan and has a higher likeliness of chipping. Plexi is not recommended in areas where flames may be present. Please speak with one of our friendly and knowledgeable staff members if further assistance is needed in choosing the right glass alternative for your project. For other safety glass options, please see our safety glass section under “Flat Glass”.